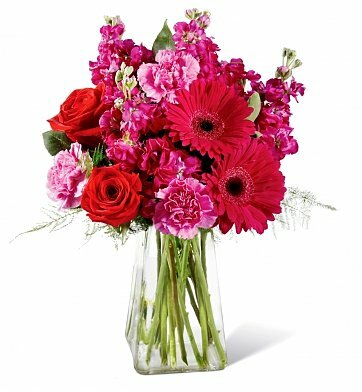 Playful pink blossoms in every shade from dark to light are sure to make your recipient's day a bright one that they'll never forget. Gracefully gathered in a square clear glass vase, this bouquet is set to create a standout offering, no matter the occasion. Standard "Good" Arrangement Measures 15" x 9". Pure Bliss Bouquet is a hand delivered gift. These gifts are delivered by one of our local design centers located throughout the United States and Canada. Same day delivery is available for most gifts when ordered before the cutoff time. The cutoff time for Pure Bliss Bouquet is 2 PM in the recipient's time zone.